White German Shepherds - probably nothing has caused more controversy in the German Shepherd dog breed than the argument over this one particular coat color - white. It is a historical fact that the first registered GSD, Horand von Grafath, had a maternal grandfather (named Grief) who was also this controversial white color. So this white color variation has been a part of the German Shepherd Dogs genetic pool since the very beginning of this dog breed. Just like solid black, this white color happens because of a recessive gene that can be hidden for several generations before making an appearance. Both parents must carry the white gene to produce white German Shepherd puppies. It is very possible that two "normal colored" German Shepherds (carrying the white gene) can produce white puppies in a litter of black and tans or sables, etc. Additionally, white is completely independent of the genes for agouti, two-tone, or solid patterns that occur in colored dogs. A good white German Shepherd should also have both dark eyes with a black nose and lips. White is also considered a "masking" gene which covers up the dog's true color, although it does not affect skin pigment. This is why "white" German Shepherds often have a cream or blond tint to their solid white coat. White coat color is completely independent of the genes for agouti (sable), two-tone, or solid patterns that occur in other "colored" dogs. White is also totally independent of either of the blue or liver dilution genes found in the breed. The white gene masks the genetic coat pigment of the German Shepherd Dog, although it does not affect skin pigment. Based on my readings, white is in a totally different location on the chromosome from the genes needed for marking colors, patterns or primary body colors. Because of this a white GSD may also genetically be of any pattern or combination of primary and marking colors as found in any of the other "darker dogs". You just won't see it because the white color gene has masked these other patterns or colors - and all you see is a solid white German Shepherd. This makes it very possible that a white German Shepherd may actually genetically be an agouti (sable) dog carrying the two-tone gene. This is exactly why black German Shepherds to white GSD's breeding can produce sables and also two-tone colored GSDs. In order to get a white coat color in the German Shepherd, both of the GSD puppies parents must carry the white gene (they must either be white dogs themselves or be carriers of the white gene). The order of dominance is as follows: Melanin is produced. (Standard GSD colors have this); Partial albinism (not seen); White coat with dark eyes and nose (not albino); Yellowish coat collar (proposed). These white GSD's are disqualified from confirmation work in the AKC though they can participate in performance events. During the 1930's, right after the death of Max von Stephanitz, was when the beginning of discrimination against white GSDs really became an issue. Funny how it never was an issue until after von Stephanitz had passed away! Genetic problems that were beginning to appear in the GSD were increasingly blamed on white GSD's even though this point has been disproved many times over by several leading German Shepherd Dog breeders and also by many prominent geneticists studying just this one topic. The white coat on a German Shepherd, 50% or more white, became a disqualification in the German Shepherd Dog in 1959 in the GSDCA parent club. Later on in 1967 the GSDCA Standard was further revised: it passed and the white coated German Shepherd Dog was totally disqualified from the show ring. There is a club called the White German Shepherd Club. Many of the club members consider themselves to be continuing this breed of German Shepherd while others believe the breed has evolved separately and should be considered a new breed entirely. The UKC will accept the German Shepherds of white color in the conformation ring where they can compete against other standard colors of GSD. White GSD's, however, are disqualified by AKC. White's are also recognized as "White Shepherds" with the UKC and in many other countries throughout the world. 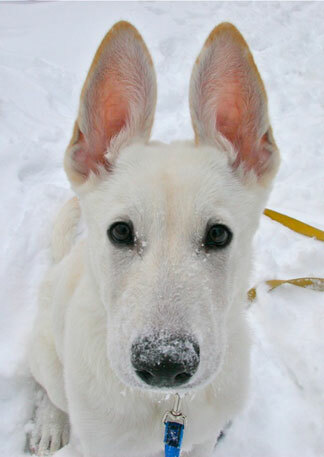 Supporters of the white German Shepherd, such as the U.S. Air Force, have found that "white Shepherds were in no way inferior, in either temperament or conformation, to standard Shepherds". 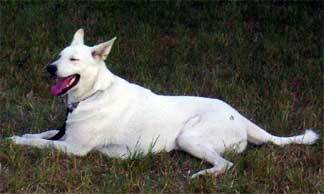 This according to a great article solely about the white GSD called, "White German Shepherd" By Gail Finkeldei. "I am presently preparing my white Shepherd for a new TV series. The problem the whites are facing reminds me of the experience I had with the Collie breeders when Lassie first appeared. "These breeders were adamantly opposed to the white blaze on Lassie's face. We had quite a battle going. But eventually, because of Lassie's growing popularity the blaze was begrudgingly accepted. Today very few people are aware this problem ever existed. "This whole mess is ridiculous. If the people opposed to the white Shepherd would just give it a chance they'd find no difference from the dark Shepherd. I'm speaking from years of experience training dogs, there's nothing degenerate about the white Shepherd!" Rudd Weatherwax, dog trainer for motion pictures and television. And: "I find that the German Shepherd is one of the smartest dogs to train and color makes no difference in their brains! I own several white Shepherds and they are very intelligent!" Tell us all about your White GSD! Do you have a great story about your dog? Share it right here!